While The Finer Reels in Life, the high-end lifestyle-themed slot from Microgaming, is great for those of you hankering after a night out on the cognac, and Betsoft Gaming’s Latin-tinged video slot, At the Copa, remains one of the best examples of a successful slots sojourn into smoky clubs, there’s still plenty of space for rivals. 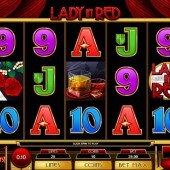 Lucky, then, that reputed slot developer Microgaming has come along with Lady in Red, a 5 reel, 25 pay-line slot that practically oozes velvet. The reels feature plenty of icons from a lounge club, with the sultry Lady in Red mixing things up on the reels with roses, whiskey glasses, a band, and a photographer desperate to get that top snap. Familiar 9-through-Ace card symbols fill out the remaining spaces. All the while, a gentle piano track plays over the top and each symbol has its own special leitmotif. The game logo acts as the game’s Wild, and, as well as substituting for all regular symbols (other than the Scatters), it awards a 2x multiplier on every win. Look out for the camera icon. Three or more of those across the reels anywhere will trigger a generous free spins round. For three Scatters, 10 freebies are yours; for four Scatters, you receive 20 spins, and for five Scatters you get 25 free spins. All free spins wins are tripled throughout. There is one more Scatter to look out for – the photographer. It won’t trigger any special bonus round but for two or more anywhere on the reels you’ll earn anything from 2x to 200x your total line stake. 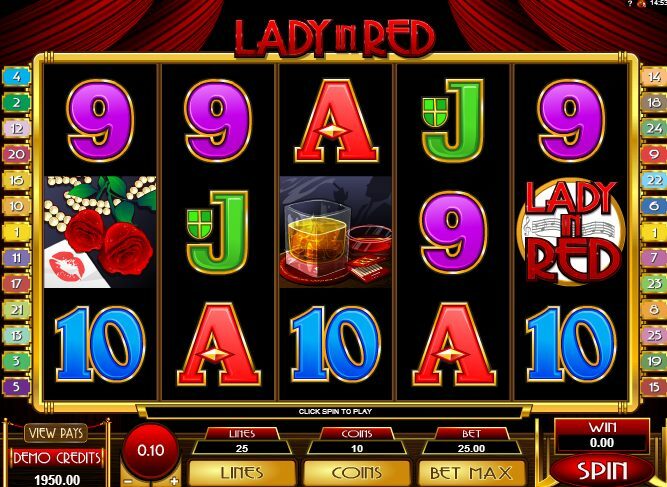 While Lady in Red is certainly one of Microgaming’s simpler slots, and it certainly will never trouble Betsoft’s efforts in the way of graphics or animation, but for those who enjoy simple bonus rounds and nice, easy-going slots experiences, it’s hard to beat. And the chilled-out piano music is a delight too.